Lassi is a popular and traditional South Asian yogurt-based drink. It is made by blending yogurt with water or milk and Indian spices. Traditional lassi is sometimes flavored with ground roasted cumin. Left: Fat-free lassi from Mumbai, India. 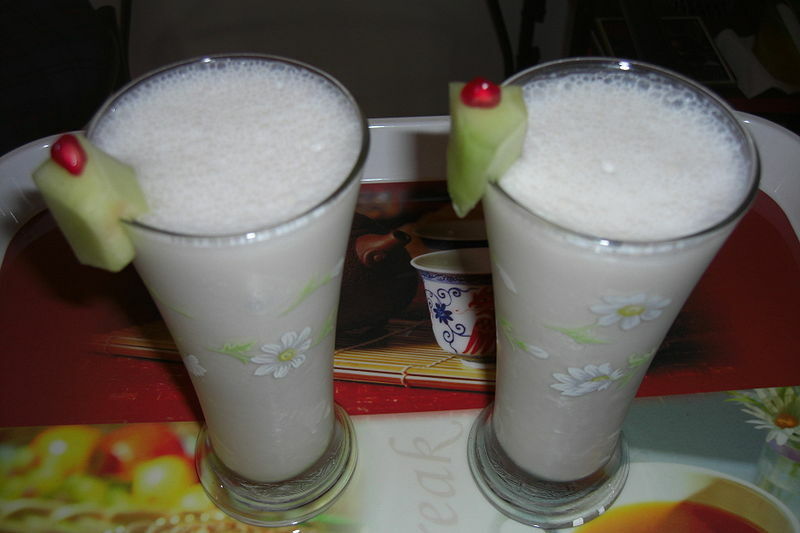 Sweet lassi, blended with sugar or fruits instead of spices, is also very popular. The most common flavors include mango, rose water, and plain sugar sweetened lassi. Lassis are enjoyed chilled as a hot-weather refreshment, mostly taken with lunch. With a little turmeric powder mixed in, it is also used as a folk remedy for gastroenteritis. Combine all ingredients except ice in blender and blend until smooth. Then add ice and continue blending until frothy.